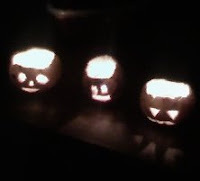 Picture of: real jack-o-lanterns, made from turnips and not pumpkins. Today I: took daughter #1 to her volunteer work at the dog agility show, through rush hour morning traffic, way across town; went to the bank and the post office; worked on Halloween video that I posted at this link; made a grocery store run for candy and turnips; carved Halloween turnips with daughter #4, you can read about it here along with the Irish folktale; read postings about microphones and storytelling: folks, listen, it is about what your audience needs not what YOU need; drove back across town through evening rush hour to get volunteering-daughter; handed out candy; went to see my sister while she hosted a kids Halloween party; prepped for my storyteller's weekend "out of the office." 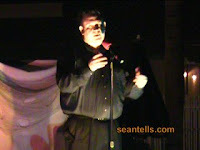 Picture of: me performing for the Halloween party at the social center on the other side of town. This is a screen-grab of the story I am posting Friday for Halloween. Details Friday. Today I: drove daughter #1 waaay across town for her volunteer time with the dog agility show and drove back; picked up the rental car; post officed; banked; re did the set list for tonight; washed clothes; packed equipment; messed around with new cell phone insurance company sent me...it is broken, too. sheesh; drove waaay across town during rush hour, along with daughter #3 as my roadie; set up and performed a 50 minute storytelling set for the senior center (Hi Lisa! ); lost my keys, daughter found them; as I was leaving the grounds, one Senior woman on the way back to her apartment said to me, "I am surprised that none of your daughters have run away from home when you tell stories like that. This was some experience." hehe; daughter #3 responded to me in the car that it is because of my stories that she would not run away; ate Wendy's dinner in the car while I waited for my fibro flare to pass; drove back across desert; looked at the video quickly; twittered; calling it a night. 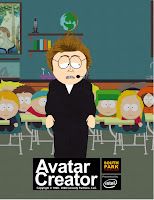 Picture of: me, interpreted as a "South Park" character (he's too skinny, tho). Pic courtesy of this website. My cellphone is missing, so I had to use something else today for the pic. Today I: paid the co-pay and ordered my replacement phone from the insurance company; updated a number of directory pages at storyteller.net with the CD's of several tellers; got a nice Email from Antonio Sacre reading, "It was such an honor to perform with you..." from the Mesa Storytelling Festival; secured rental car for this weekend's engagements; talked with sponsor for Thursday night's storytelling show; twittered; was felled for a few hours by a fibro migraine; worked on a few audio and video files for publication on Friday; set up an appointment with a storytelling-coaching client for next week; post officed; traced down some order problems from the old store. Picture of: me holding the sponsors sign at the "Adults Only" show at the Mesa Storytelling Festival (MSF) this last weekend. Thanks again to Mark Goldstein for photo. Today I: worked on audio and video files from the MSF-which should be posted Tuesday or Wednesday; post officed; banked; ate lunch with daughters #1 and #4; evaluated some promo materials; updated contacts database of my storytelling friends, customers and clients; read one blog another posted about the MSF; yet another blog here; read another blog posted by another teller from the NSF; had dinner out with my wife. Picture of: last night's tellers in the "From the Edge" adult storytelling concert at the Mesa Storytelling Festival. From left, there is Kindra Gayle, Antonio Sacre, Harriet Cole and me. 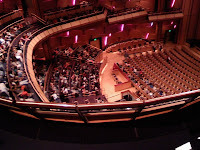 Picture of: Balcony level pic of 1500 school kids gathering for the Mesa Storytelling Festival today. Three-levels of seating in this theater, kids do *great* job as audience. Today I: ate hotel breakfast, cleaned up and checked out; participated in world-class school show with 1.5K kids; MC'd event; coached a teller on what they might present at the rest of this festival; journeyed home to clean up and regroup for evening event; talked with my wife about how much I was affected by the excellent events of the last 24 hours; got back in time for evening concert- got to be audience for a while; told and MC'd for "adults only" storytelling late-night concert; home to wash clothes and catch a few winks before big day at festival on Saturday; wrote some random thoughts about last two days while they are in memory- will post later. 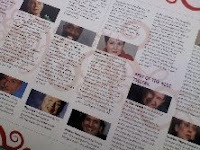 Picture of: the program, listing all the tellers, for the Mesa Storytelling Festival- which began today. Today I: packed up for my overnight in Mesa; made the drive across the metro area; listened to (and was the MC for part of) sessions of storytellers Sandy Oglesby, Sheila Kay Adams, Kala Jojo and Shannon Pauly tell for a small (and well behaved) group of school children; shared lunch with several tellers in the green room at the Mesa Arts Center; checked into my hotel; worked more on my story for the "Best of the West" concert; started a twitter stream for photos from the festival; participated in the evening concert with my new version of "Beauty and Beast"; back to hotel and writing you this note. Looking forward to more participation on Friday. Picture of: me and Marilyn at the storytellers' welcoming reception for the Mesa Storytelling Festival. Not sure what we we are doing here in this picture, maybe something scary? Today I: picked up the rental car; made hotel reservations in Mesa for Thursday; delivered my CD's to the consignment shop at the Mesa Arts Center- nice joint- friendly staff; kept on flaring; made the far-away drive to the reception in Gilbert with staff, volunteers, sponsors and storytellers for the Festival which kicks off on Thursday; talked through my newest version of B&B over and over again in my 45 minute drive home; photo by Mark Goldstein, who in addition to being a fine human being in his own right, is the husband of the MSF director, Liz Warren. 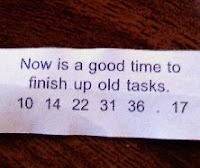 Picture of: my fortune cookie at lunch knowing what I would do the rest of the day. 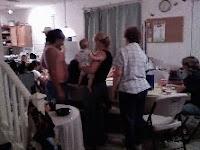 Picture of: just some of the crowd at our house tonight for the October birthdays- both sides of the family- 33ish people ranging in age from four weeks to 69. Intergenerational, lol. Today I: prepped, cooked and presented this party. No time for anything else. Fibro now attacking back. Bad Fibro; love the parties, hate the recovery. 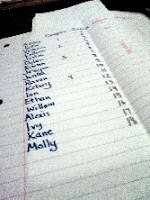 Picture of: the list of all the children in our extended family, with the numbers of who is which number of daughter, cousin, niece and nephew. My wife made the list for me because I always get them wrong on this blog. Well, not the daughter part. For example, third-grade nephew #3 is not playing high-school football as I incorrectly posted earlier. That would be nephew #2. You may now sleep better at night, I know. Today I: spoke on the phone with a client about an upcoming storytelling engagement; went to the bank and post office; wrote draft of future blog post; planned a wedding; caught up on Email; did some research on a new storyteller project; listened in to telecourses being taught by others; made pans and pans of cornbread for family party on Saturday. Picture of: stack of beans, tomatoes and hot sauce. Today I: continued the search for the top of my desk, purging old files, making new ones; ate lunch with my wife; led a teleconference for those who ordered my "Outside In Storytelling Marketing" audio course; went grocery shopping for the family party coming up this weekend, hence the picture to the left. 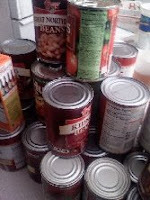 Making chili(s) for 30+ people takes a LOT of canned goods. 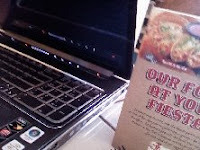 Picture of: my laptop (oh the pain) sitting on the table at the Rubio's restaurant today during my lunch and writing session. 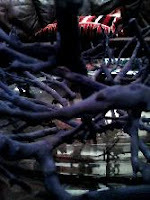 Picture of: the frog who adorns my latest blog post. Today I: made chicken chili for my family (sometimes referred to as "white chili" as it does not have a tomato base); drove out to the wedding site with my brother to view the location and talk to he and future bride about the wedding coming up soon; had an initial consultation with a new storytelling coaching client; finished my latest blog post on the adaptation of "world tales" to business storytelling uses. 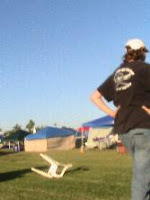 Picture of: daughter #1 surveying the wind swept fields at the agility competition where she runs her dog(s) for show. Today I: took wife and daughters #1 and #4 to the park 'cross town where the dog runs take place- it was actually cold today at 530AM; came home and napped after dropping them off; continued to reassemble my life onto new computer (OMGoodness, did that hurt)- there is light at the end of the data disaster tunnel; worked on developing new coaching proposal for corporate storytelling coaching client who is based out of California; finished corrections to new blog article which I will post on Sunday; returned to dog park to watch daughter and dog compete tonight; packed them up for the night; drove home, did the grocery store and make dinner thing; called it an early night. Picture of: closeup view of a centerpiece (and necklace) on the table at my friend Liz Warren's home. It's about 24 inches across, made with blue sticks joined by wire forming a large collar that can be work around the neck- for costuming only. Liz has used it to represent the Cailleach. Picture of: me frowning, taken by daughter #3. Today I: suffered a computer crash. Back ups: yes. Equipment: no way. I run everything via my laptop. Most of my work comes through the internet. I am not a happy storyteller. Borrowing computer to make things happen, check email etc. Picture of: some of the kids (at the church I told stories at today) prepare to dance the "Rosh Hashannah Macarena" before the service. 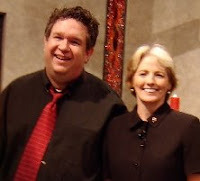 B onus Pic: me and Katharine Harts, the pastor of the above listed church. Katharine has a MFA in dance in addition to a whole lotta years in youth ministry, workshop and pastoral ministry. Just an interesting person to work with. 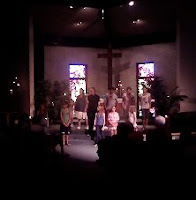 It's not often you find a pastor with a degree in theater/movement and is able to actually use it in actual pastoral use. Just fun. 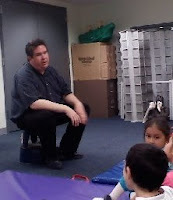 Picture of: me telling stories at the library today. Great big storyteller, little-tiny stool. Today I: took my kid #1 into work at 445am; fine-tuned one of the new stories that was on the set-list for today; presented the library storytelling show to a small group of children- I must note that today the adults in the back of the room were *wonderful* as they participated and modeled excellent behaviors for their children- this was at a library in a tough section of the city- great great parents and library staff; worked on updating Storyteller.net; did more of that background stuff I've been not-telling telling you about; attended a family birthday party (HB Jay, Richard and Alexis); came home to work on "Nicodemus" for a sacred storytelling and acting engagement I have in the morning. 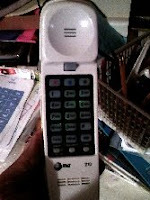 Picture of: a telephone in my home office. Today I: worked on lots of not-ready-for-the-public background things; talked with a colleague about the state-of-storytelling issues; talked with a sponsor for event on Sunday; participate in a mastermind teleconference; participated in a speaker-marketing teleconference; had dinner with my wife; researched stories for this weekend; I have been told to correct myself in that I have 5 nephews and not 3 as previously posted; Happy Birthday, Erin.